And to check the line up of the others stages of the festival check the official webpage! Like every living organism on this planet we are in constant transformation. We believe that changes are welcome whenever new things come to add and whatever is past us stays in our hearts and minds, like the fertile and caring ground that has made us grow and reach the point we have today. After six years in the beloved city of Ituberá, where we sowed and harvested knowledge, enterprises and, above all, friends, it is now time to sow different grounds. Since the birth of our project we have been itinerant and our objective is to bring alternative culture, peace and love to all those who wish and know how to live such magic. The new local government and its new management have made it impossible for us to continue in the same place. To preserve the Festival, taking advantage of the great new alternatives that have appeared, we have decided to move the Festival to a new location. The new place is just as beautiful as the paradisiacal beach we are used to. It is situated between Morro de São Paulo and the Itaparica Island; about 80km from Bom Despacho (drop off point of the Salvador Ferryboat). The people and the government of Bahia welcome us with open arms once again, as is typical of the baiano charisma. Garcez Beach, on the d’Ajuda Island (Jaguaripe County) is another fantastic beach of the Dende Coast. The beach is situated between sea and river, surrounded by Atlantic Forest and coconut groves - a stretch of 1000 meters of private beaches where there are no cars. The camping site has many shaded areas and the parking lot is at the entrance gate, practically inside the Festival itself. There are many fresh water rivers in the vicinity, so you have the option now of bathing either in salt or fresh water. Just to give a final touch to our celebration, we will add one more day to the festival. 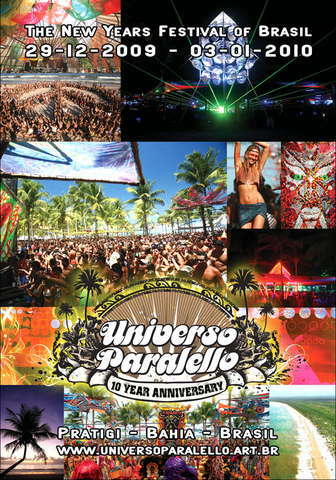 On our 10-year-anniversary special edition, Universo Parallelo invites everyone to once again celebrate the New Year on the beach – now in the Garcez beach on the Island d’Ajuda, from December 28, 2009 to January 03, 2010. We begin the preparations for our 10-year-anniversary party taken by a unique sense of joy. This gathering will synthesize all the magic of a decade of celebration among friends, surrounded by art, alternative culture, nature and whole lotta music. The UP 10-year-anniversary party sets off in a renovation mood and you are a crucial part of this commemoration. Let us turn this gathering into a great ritual and begin another cycle of joy, brotherhood and learning with our friends and nature. Let the rhythms multiply and the feelings unify into a single frequency. Soon you will find more detailed info about the preparations and the attractions of this great gathering. For the time being, Universo Paralello, once again, welcomes everyone. Pre sale info’s will be available around September – Stay tuned!